If you're like me this time of year it's very often 11am and I haven't even remembered to have my coffee much less breakfast...life just get's too busy and, well, I need help to have that first meal of the day. This recipe makes having a nutritious breakfast easy. It's protein filled, gluten free and just plain good. Optional: Chopped Green Onion for garnish. Pre-Heat oven to 375. Mix all ingredients except green onion. 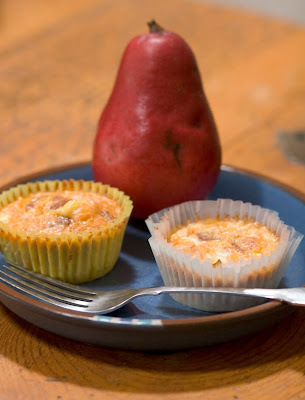 Place paper baking cups in 12 slot muffin pan and then spray the cups with Pam. Pour egg mixture into cups about 3/4 full. Sprinkle a little green onion on the top of each one. Bake about 25-30 minutes, until eggs are slightly browned and set. These little gems can be kept in the fridge for about a week or frozen. Microwave to warm, one to two minutes on high. It's the simple pleasures that make life good....sharing is just one of them.